It started out as one of those trips you had to keep up your spirits by reminding yourself "They're in There". It was hot, mid 90's. The water was low, the moon was full, and no one was catching fish. Even the motel owner got into the act cautioning how bad the fishing had been lately. With that as a backdrop Mary Nishioka, Sue, and I set out to fish the Upper Sac and the Nature Conservancy water on the McCloud River. We drove up Saturday, September 21st. After the obligatory stops at several fly shops, had just time to fish for a couple of hours in the evening on the Upper Sac. While Mary and I tried to create a hatch casting dry flies, Sue landed what turned out to be the largest fish of the trip. The next day we fished the McCloud River on the Nature Conservancy. The fishing was so good we only walked the first quarter of the water (i.e. Nature Pool, Vivien Pool, Yew Pool, and Ted Faye Riffle). With the exception of Ted Fay riffle, it all fished well using the same nymphing set-up as on the Upper Sac. According to the guide, the McCloud fishery has fished very well this year with the average catch rate up. Sue ended the day on this special stream landing two sixteen-inch rainbows. 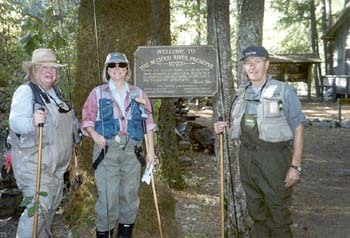 The fish were redband rainbows for which the McCloud River is known. They didn't disappointundefinedleaping high and fighting hard just the way they are supposed to. McCloud rainbows are sturdy, wild fish that never fell off the hatchery truck. We highly recommend guide Ron Hart. Heck he even changes tires. Mary shredded a tire on the rough road down to the Nature Conservancy water. The "McCloud Pit Crew" sprung into action. Soon we were on our way, claiming our daily rod tags just in time. On the way out, at the Nature Conservancy sign-out area where we provided survey data on the day fishing, we met an old man patiently waiting for a tag (only ten people on the stream at a time). He asked how we did. I said, "ok". "You need to come again", he said, "because believe me they're in there." Amen.